The SQ format was way ahead of it's time. Unfortunately quad died around the same time that the decoders began to get somewhat good. Different approaches were used to "bring out" that neato matrix quad sound. When the first decoders were built, the quad effect was almost imperceptible. Logic circuits were then developed to enhance the separation between all the channels. The first logic units were only "front/back" and the last form of logic was the Tate DES (Directional Enhancement System). I created some animated gifs from the exact same portion of 1 song using 5 different SQ decoders. Some of these decoders are easily available on Ebay while others are not. The song used is Chase's Open Up Wide. The trumpet moves to each channel starting from the front left then moving to front right, rear right, then rear left. The band then joins him from all around. I created these using the scope built into my Marantz 4400...a battleship in the fleet of quad receivers. I slowed down each animation so it's easier to view the motion. Notice the front to back relationship in each one (front being the top of the scope) and general sound field blurring. Yes, I know this isn't a perfect test but I needed something visual. I hope this helps if you are looking to get into quad again...or for the first time. Got a question or comment? E-mail me. What was the sound file? Hear it in mp3 format. These may load very slowly....enjoy the wait. Try humming an Enoch Light tune! SONY SQD-1000 This was Sony's first attempt at an SQ decoder. It had absolutely no logic circuitry and it showed. There is front left/right movement, but there always seems to be something in the front and rear simultaneously. This unit has about 3db separation front to back. I found that the best way to listen to this box is with the rear channels slightly hotter than the front which gives a little more punch to the rear channel left/right effects. This unit also has RM and a discrete input. Unfortunately since this was the first decoder, a lot were sold but it didn't impress many people about the wonders of SQ. REALISTIC SQ-II This is one of Radio Shack's answers to SQ decoding. 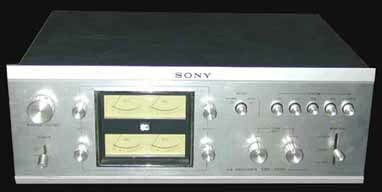 Very similar to the Sony SQD-1000 because there is no logic control. No RM, but it does have "Stereo All" which doubles the stereo signal and sends it to all 4 speakers. It does have a discrete input (as does the Sony) and it also has "Tape SQ" which is really just another input for you to use that will pass through the decoding circuit. Not much else to talk about. Because of it's smaller size and weight, it does not make as good of a doorstop as the Sony unit! SONY SQD-2050 Here's an upgrade to the SQD-1000 and is a very good "starter" unit. It has about 12db Front/Back logic and a fairly good RM mode to boot. It has difficulty moving the sound to the correct location in a hurry, but you can hear things move around. It does OK in separating center back from front, but individual channel location is still a little smeared. When the sound goes to the back, there is still a some sound coming out of the front (notice that the scope usually shows a triangular pattern on it). Slow response times but a very smooth sound. On thing to note about some Sony units if buying one. Sony was using circuit boards that were stamped on each side with bridging solder points that go through the board. These little buggers go bad after a while and makes this unit cut out channels and just act weird. Touching up these solder points will usually fix the problem and it's pretty easy. Lafayette SQ-L Where I grew up in Wayne, New Jersey there was a Lafayette Radio Electronics store. This was part of a small chain of stores located mostly on the East coast and they were "leading the quad revolution." The company folded in the late 70's. 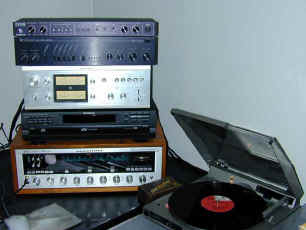 They had the first receiver with a built in SQ decoder and a variety of other quad goodies. The SQ-L was one of their decoders with Front/Back logic. It sounds very much like the Sony SQD-2050 but has a slightly smoother sound and pretty good imaging. Contains a dual setting "Composer " circuit for RM. A very plain look to it, but overall not bad for an early decoder. Many people like this decoder because of it's "smoothness." Marantz SQA-2 Module Just for grins, I tried the optional plug- in SQA-2 full logic decoder in my Marantz 4400 quadradial receiver. Hey! This thing looks great on the scope. Darn near Tate-like. Unfortunately this test is very deceiving. The Marantz can really move sound around, but it is a harsh "steering" decoder. It will give you good ping-pong quad if that's what you like (that happens to be what I like, anyway) but overall lackluster performance on regular ambience quad. Only the Tate can keep the signals where they need to go. Sony SQD-2020/2010 The Sony SQD-2020 was one of Sony's top dog performers in the SQ decoding world and is still very popular among the quadraphonic community. A full featured box with a great display and controls, this unit could almost be used as a pre-amp for a quad system. As far as performing, it is only slightly ahead of the Sony 2050 on the scope, however I can detect more movement going on during my listening test then I could with the 2050 and it is very smooth. The 2010's look exactly like these units but were made in the mid to late 70's and feature "advanced Sony IC's" inside that are less prone to trouble and have much better steering control. I would definitely opt for the 2010 myself. On the scope, it looks more like the Marantz SQ-2, but not as harsh. A very popular option is to own one of these beauties and a Tate II but run the Tate into the discrete input so it can be monitored using the Sony's meters. Special thanks to Ken Wilson in California shipping me this 2020 for testing. A great member of the quad community. NOTE - If you have a Tate II or the Audionics Space and Image Composer and it is need of repair, there is only one man that I know of that can still fix 'em (so long as the proprietary chipset is not fried, they are unavailable). Contact Bob Popham. His website is www.rjpc.com. He is also a heck of a nice guy!